Image: Dea V. Giannella/Getty Images. IMDb. Design: Ashley Britton/SheKnows. The early years of Robin Wright’s Hollywood career are a testament to the journey so many young women take toward realizing their own agency. From The Princess Bride’s Buttercup to Forrest Gump’s Jenny, Wright’s first few well-known roles were well-intentioned women who either never had the option of choice or didn’t think they deserved it. Now, nearly four decades into her career, Wright has shown that she is actively selecting roles that prioritize traits like power, intelligence and independence — traits she exudes in real life as she works to destroy the patriarchy by demanding equal treatment and through her roles in works like House of Cards and Wonder Woman. Back when she was a budding actress, Wright took on roles that often served as vehicles through which men could showcase their masculinity. In The Princess Bride, Westley, Prince Humperdinck and three kidnappers battled over Buttercup. Although she got a few good one-liners in, Buttercup’s story arc revolved largely around the whims of men. After The Princess Bride, Wright moved on from pretty princess Buttercup to self-destructive Jenny, the love of Forrest Gump’s life. Whereas Buttercup yearned for her happily-ever-after with her Prince Charming, Jenny never thought she deserved one. She struggled to take care of herself but didn’t want to let anyone else do it, either. How many men probably told young Jenny that she wasn’t worth it? My guess is, so many that she started to believe it was true. Jenny loved Forrest, but she needed to learn how to rescue herself. Sometime between Forrest Gump and House of Cards, both Wright and her characters grew to take their own success and happiness into their own hands. Wright focused on raising her family, then decided to end her on-again, off-again marriage to Sean Penn and focus on herself and her career. Right around this time, the characters she absorbed began to reflect this shift in perspective and power. We got a glimpse of these strong-willed, independent women who were ready to walk their own path and take no prisoners along the way when Wright played Erika Berger in David Fincher’s adaptation of The Girl With the Dragon Tattoo. Erika is a cool, confident editor-in-chief with a penchant for bluntness who insisted on getting what she wanted both in the magazine industry and the bedroom. Once Fincher recruited Wright for House of Cards and we were blessed with Claire Underwood, the influence both the actor and her characters carried over the next five years has impacted the way women are viewed on screen, in politics and on the pay scale. Wright fought for equal pay on House of Cards, using research on her character’s popularity as leverage to demand the same salary as her costar. She noted that she told studio heads she would go public with the difference between her pay and co-lead Kevin Spacey’s if they didn’t agree to increase hers to match his. And they did. The range of characters she has played over the decades has certainly displayed a spectrum of female power, and it's only become more intense as Wright has crossed over into her 50s. 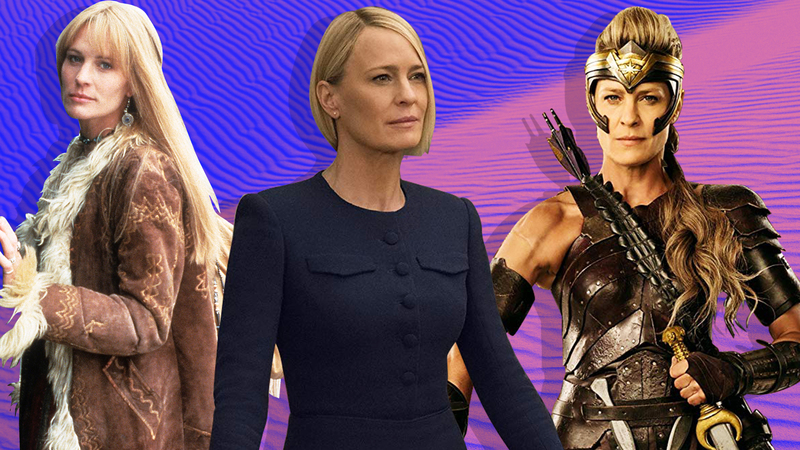 In the last two years, Wright's Claire Underwood has assumed the powerful role of president of the United States and, on the big screen, Wright transformed into an Amazonian general in Wonder Woman. Antiope is charged with preparing other women to be warriors, to take care of themselves in a world without the power of men. Antiope is, to put it simply, astonishing. She’s a woman who wields a sword, setting a fearless and ferocious example, and uses it to better womankind. It doesn’t get any more powerful than that.